Vincent Scully, Jr., Louis I. Kahn (New York: George Brazilier. 1962), p. 10. To begin to understand Kahn requires a major intellectual effort, and indeed it ultimately involves the rewriting of contemporary architectural history. A generation brought up on Hitchcock and Johnson International Style, of 1932, or even Giedion Space, Time and Architecture, of 1941, could hardly hope to perceive Kahn's quality at once. Nor could he, more importantly, have been able to find himself easily in it. From this observation, one of the major factors contributing to Kahn's lack of significant production during the thirties and forties comes to light. Kahn was, in large part, a part of that academic education, centered upon the French École des Beaux-Arts and called in America, generically, Beaux-Arts, whose later phases many historians of modern architecture, including myself, had so long regarded as bankrupt of ideas. In a formal, symbolic, and sociological sense the Beaux-Arts probably was bankrupt by the early 20th century, not least in the 1920's in America. But the researches of Banham and, more recently, of Stern, now force us to recognize the tenacious solidity of much of its academic theory, as distilled from Viollet-le-Duc and others by Choisy, Guadet, and Moore. That theory insisted upon a masonry architecture of palpable mass and weight wherein clearly defined and ordered spaces were to be formed and characterized by the structural solids themselves. One of the earliest extant drawings by Kahn, a student project of 1924, shows that he learned that lesson well--apparently better, as a comparison could demonstrate, than the other students of his time. Kahn's characteristic difficulty with the skin of his building, with, that is, the element which seemed to him neither structure nor space, is equally apparent in a comparison with other contemporary projects as, for example, with that by William Wurster, published at the same time. Kahn was also trained in the Beaux-Arts manner to regard the buildings of the past as friends rather than as enemies, friends from whom one was expected, perhaps with more intimacy than understanding, to borrow freely. 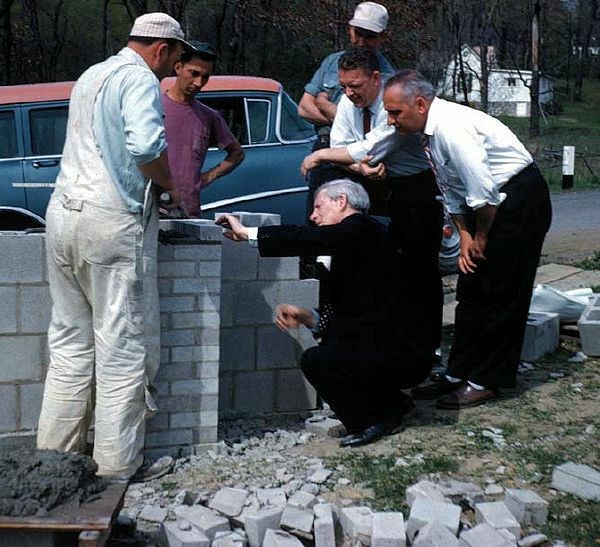 Kahn at the construction site of the Tribune Review Press Building, Greensburg, Pa., circa 1960-61.